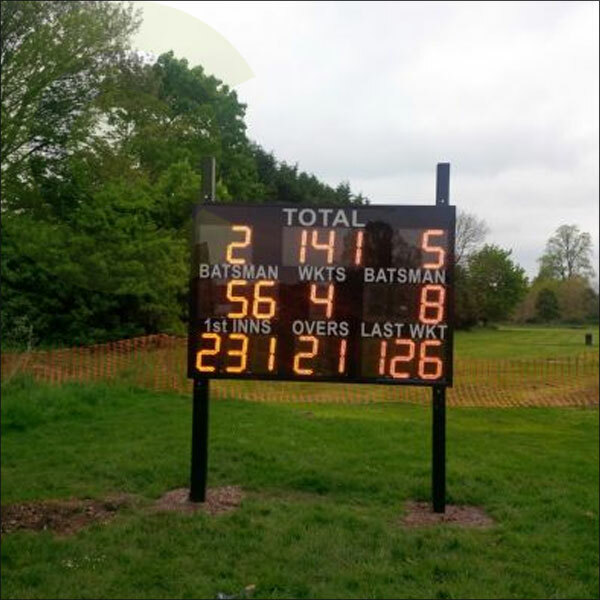 Large Club Specification Electronic Cricket Scoreboard - CRA Cricket UK. High visability large format club specification match digital mobile cricket scoreboard. Large display electronic numbers offer a clear record of the scores, controlled remotely. 22 off 12” amber LED digits. Housed in aluminium enclosure approx 2200mm x 1500mm x 120mm. 90kg. Powder coated black with anti-glare polycarbonate front. 230v mains operation. Can easily be fitted to a wall, pavilion or posts.